New England Biolabs® (NEB) has announced the release of the NEBNext Ultra II DNA Library Prep Kit for Illumina® next generation sequencing systems. The new Ultra II kit substantially improves upon its predecessor to produce libraries of both higher quality and higher yield from a variety of sample types, including challenging ones, such as formalin-fixed, paraffin-embedded (FFPE) samples and those containing low amounts of input DNA. "The boundaries of library construction are constantly expanding as sequencing technologies evolve, necessitating reagents and protocols that are reliable, and don't compromise library quality," said Fiona Stewart, NEBNext Product Marketing Manager at NEB. "We've re-engineered our reagents for this new generation of NEBNext kits to accommodate as little as 500 pg of input DNA, increase yields, use fewer PCR cycles, and provide even more uniform GC coverage, all with an automatable workflow." The NEBNext Ultra II kit addresses many of the difficulties associated with library preparation, according to reports by early access users. For Vladimir Benes, Ph.D., Head of GeneCore at EMBL in Germany, low-input genomic DNA is a significant hindrance with other protocols. "The possibility to use the new NEBNext Ultra II DNA kit has provided us with a critical opportunity to process challenging low-input genomic samples. These samples otherwise didn't yield libraries of adequate complexity, required for exploring their genomes comprehensively," said Benes. "Using the NEBNext Ultra II DNA Kit has alleviated this problem and enabled us to deliver high quality, high content sequencing data that are relevant for our users." "The protocol is very easy to follow and is a step up from the standard NEB Ultra Kit," added Christopher Smith, Ph.D., Post-Doctoral Research Associate at the Cancer Research UK - Cambridge Institute (CRUK-CI). "Using as little as 500 pg of cell-free DNA input, we were able to generate libraries that were successfully used for subsequent exome capture." The NEBNext Ultra II workflow combines the End Repair and dA-Tailing steps and minimizes clean up, making the kit fast and easy to use. NEB's protocol for constructing DNA libraries with Ultra II requires just over 10 minutes hands-on time and can be finished in ~2.5 hours. 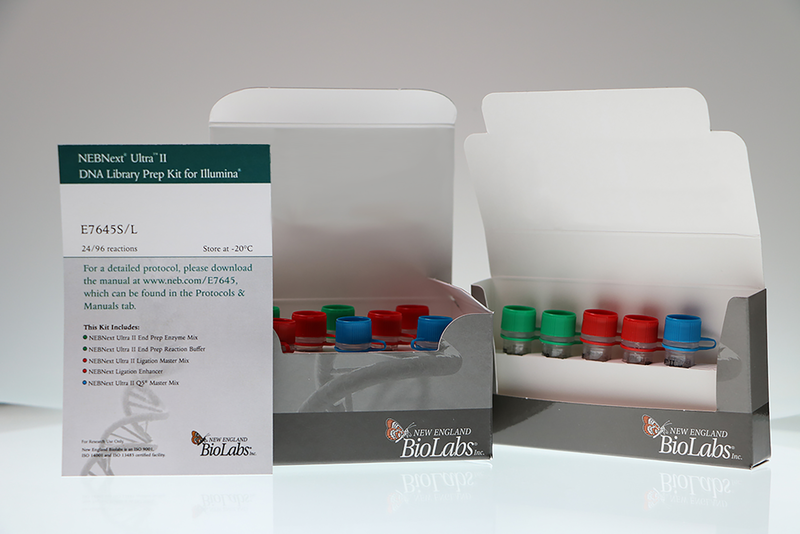 The protocol is compatible with adaptors and primers from NEB or other sources, and can be used in PCR-free and target-enrichment workflows. NEBNext Ultra II DNA Library Prep is available in kit or module format, and the NEBNext Ultra II End Repair/dA-Tailing Module is also compatible with some Oxford Nanopore MinION™ workflows.